So I won’t lie, I’m one of those old school guys who loves carrying my bag and walking the course rather than taking a golf cart out and going into some fancy bag for a club. However, recently back problems and age have started to set in and carrying my bag has gotten harder and harder, not to mention my bag has gotten older and older. Holes started appearing on the bag, things became outdated and the bag was wearing thin. And with my back problems, I wanted something to make golf easier. The first thing that hit me was its weight. It barely feels like I’m carrying a bag. It’s only 4.3 pounds and takes a lot of pressure off my back compared to what I previously owned. Even if I add more clubs to my bag, you wouldn’t know it because the weight still feels light. Another thing I love is the comfort when you carry it. I used to come home from golfing with blisters on my shoulder from the strap, and like I mentioned, tremendous back pain. 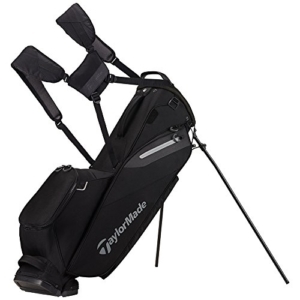 The Taylor Made Flex Tech Lite Stand Bag has extra padding in the center of the shoulder strap that actually makes carrying a bag comfortable. It is also very easy to adjust to what you need it to be for carrying and the straps are cushioned. It is available in both single strap and double strap. The bag also has some amazing features that didn’t come with my other old school bag. For one, it has an insulated water compartment. That compartment is kind of needed when you live in Florida like I do, and anyone who plays golf in the summer plays in the heat. It makes grabbing it and drinking while you walk very easy. Another beneficial feature I like is the stand. It’s very easy to unfold, set it up, fold it back up and put away. It has a patented smooth release and collapsible base system. The stand is also very sturdy. No matter how many clubs you carry with you in your bag, it holds it extremely well. Speaking of clubs, when it comes to storing them, the bag has full length dividers that keep things from getting too cluttered, and I carry 15 or so clubs with me when I play. It’s also easy to locate clubs as long as you organize them properly before you go out. As far as pockets go, this Flex Tech bag has 8 of them, meaning you can pack a lot of extras with you when you go play. It has a separate bag for tees, shoes, maps, course cards, water and other valuables. It keeps you prepared for anything you may experience on the course. However, not all is perfect with the bag. There are some improvements that can be made to make it even better for when they unveil their next upgrade. I would have liked to have seen another handle. The top carry handle is convenient and makes it easy to maneuver, but I would like prefer another one or two handles in different areas. Another con is that while some people enjoy the full length dividers, there are golfers out there who prefer more holes for the clubs. Like I said, while the dividers are wide, it can clutter for some, especially if you have a lot of clubs. So if you’re one of those golfers out there who want a hole for each club, it may not be suited for you. It’s also not cheap. You’re going to get a great bag but with a steep price. Keep that in mind as you are shopping around. Many golfers like to spend $100-$150 on a good bag. This one is close to $200 at most outlets. All that being said, despite some nit-picking here and there, if you walk like me, you want to have a bag that gives you the most comfortable experience possible while playing. Not to mention you want to come home and not have back pain, blisters or shoulder fatigue. The TMFlex Tech Lite Stand Bag passes the test in these areas. It makes playing the game more comfortable and convenient. So if you walk the course and are looking for a new bag to make the experience more enjoyable, there are not many bags better than this one. Make walking the golf course fun again.